Harrisburg, September 16, 2014 — CeaseFirePA today brought hundreds of Pennsylvanians to the Capitol to urge legislators to focus on measures to make Pennsylvania safer. 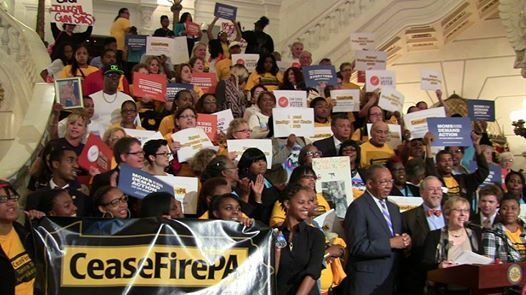 In conjunction with the Center for American Progress Action Fund (CAPAF), which released a new report highlighting the increasing danger of long guns, advocates urged PA to expand the background check system to cover the private sale of long guns. Joining CeaseFirePA and CAPAF were gun violence victims and survivors and Pennsylvanians from across the Commonwealth. Since 2008, 18 law enforcement officers were murdered in PA; 9 of these were killed by long guns, included Cpl. Bryon Dickson, who was murdered Friday night in the attack on the State Trooper Barracks. FBI data shows that the use of guns other than handguns in murders has more than doubled in Pennsylvania since 1998. Speakers pointed out that although the background check legislation has been stalled in committee, the House might instead be advancing legislation that actually would be dangerous for Pennsylvania. HB 2011 would change the traditional rules of legal standing and give a special right to gun owners and organizations of gun owners to sue cities that enact ordinances, like lost or stolen reporting, to protect their communities. Mayor Rick Gray of Lancaster and Mayor John Linder of Chester both emphasized that mayors and town councils prioritize public safety above all else and should not be penalized and even possibly bankrupted by punitive law suits.